A few weekends ago I found myself in HEMA (a Dutch interiors, snacks, and household shop) picking up a few things and I spied a cushion cover for a fiver that I liked the look of. 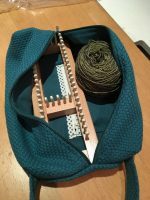 I'd been meaning to make myself a project bag for my sock loom and various supplies for a while now, and I saw the potential! I was also too excited to get a Before photo but it's up online and now I see it's only £2! Figures! The cushion cover featured a loosely woven fabric on one side (which I used as the bag exterior) plus a plain canvas on the other (which became the bag lining) and a matching zip so it was excellent value considering the zipper alone would’ve cost me around £3.50! A few weekends ago I found myself in HEMA (a Dutch interiors, snacks, and household shop) picking up a few things and I spied a cushion cover for a fiver that I liked the look of. I’d been meaning to make myself a project bag for my sock loom and various supplies for a while now, and I saw the potential! I was also too excited to get a Before photo but it’s up online and now I see it’s only £2! Figures! The cushion cover featured a loosely woven fabric on one side (which I used as the bag exterior) plus a plain canvas on the other (which became the bag lining) and a matching zip so it was excellent value considering the zipper alone would’ve cost me around £3.50! 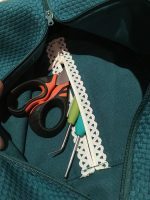 I wanted a lining pocket to store all the little bits I need for loom knitting (pick, crochet hook, scissors & yarn needle) so I added a patch pocket with a fancy Prym lace-look zipper from my stash. 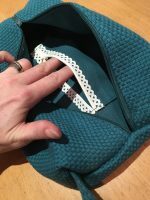 This inner zipper and some interfacing were the only supplies I added to the original cushion cover so it was a great bit of opportunistic recycling on my part! 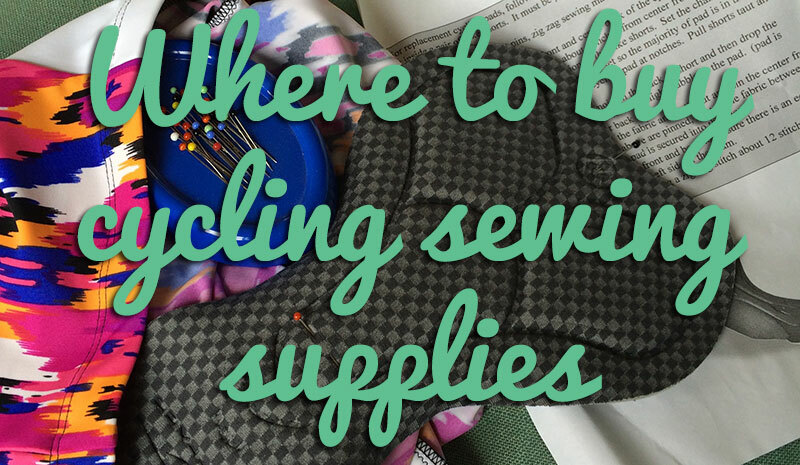 I didn’t use a pattern here but I did refer to StacySews’ Box Bag tutorial to get the ends right (which, if you recall, was the same tutorial I used for James’s Tour de France washbag a few years ago). 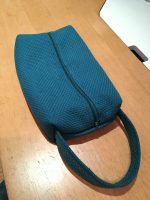 This bag was a quick little project, but it makes it so much easier to just grab my sock loom and be able to loom knit on the go without having a big ball of yarn hanging out in a second bag or the plastic yarn needle getting lost in the cracks. 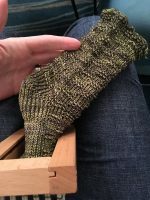 When I was over in Denver filming my Craftsy class I stopped in at Fancy Tiger Crafts and bought some variegated green merino wool that was hand-dyed in Colorado, and between the flights, downtime in my hotel room, and hospital visits once I got back home, I managed to finish my fastest socks yet – just under 3 weeks from start to finish! I really like the checkerboard pattern on these and I think they look way more complicated than just the knit and purl stitches I used to achieve it. 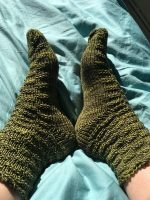 I used the Kb Sock Loom 2 for these, which I find a bit more versatile than the Prym loom I learned on last spring. Has anyone else started loom knitting since I started posting about it last Spring? I’ve got a little “Sock Cult” group in my office but I still get SO many stares and questions from people (even traditional knitters!) when I’m out in public! Separator image Posted in Gallery and tagged with bag, knitting, recycled. 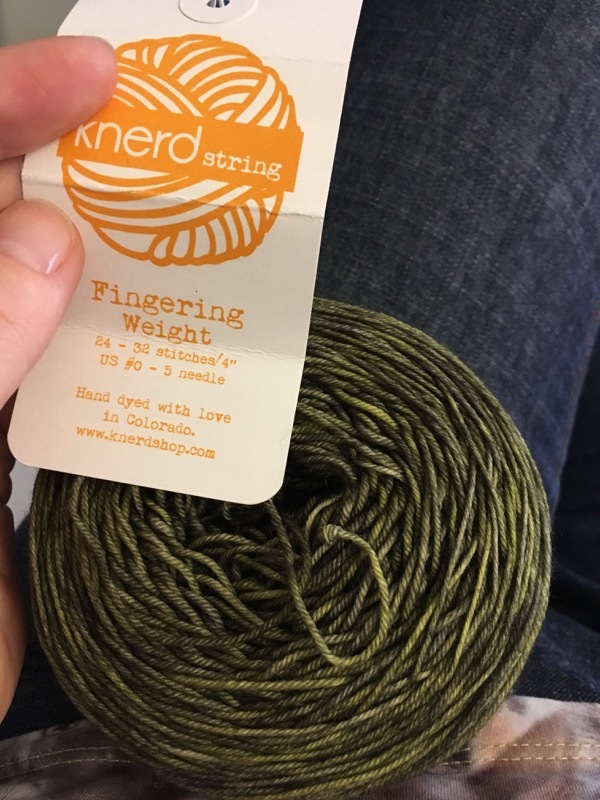 I bought a regular Kb knitting loom several years ago. I want to make sweaters. 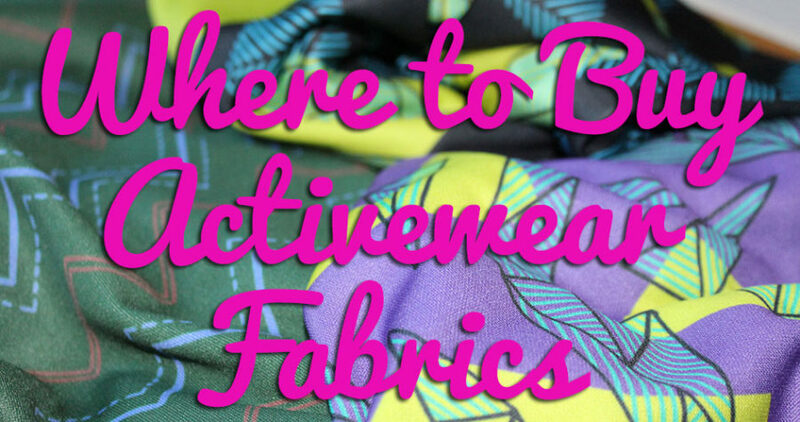 I also want to make knitted fabric to felt. However the thing sits in a corner gathering dust. 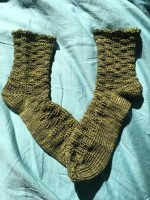 I love your socks and want to knit my own. I wonder if I buy the sock loom would I actually use it? 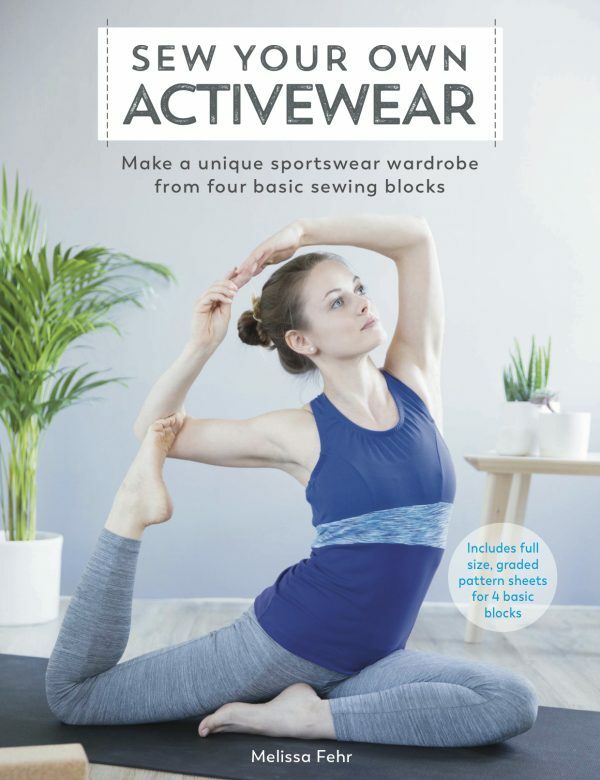 Hi Melissa, YES your Prym socks post caught my imagination so I was then bought the loom as an Xmas gift having gone on about it to my best friend; did 3 pairs, joined Ravelry Loom Knitters group and now have a collection of looms. I have all 3 KB sock looms, the SL2 is by far the easiest so would recommend that as the starter using aran or DK, the Orig SL for DK or 4 ply and the EFG loom for very fine socks-I have not used that one yet. 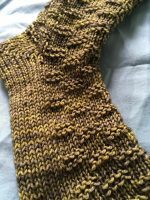 Ravelry Loom Knitters group is really friendly and full of help so can highly recommend it, and its all free.